Ok, hear me out here, I'm not suggesting you hand a toddler a paint brush and let them loose in your home but I am suggesting that you involve them in the process. My son loved following my husband around "showing" him the holes in the walls that needed to be patched and then painted. My husband made sure to "miss" a few so that my son could feel super involved - and my son is still talking about how he "helped Daddy do the holes". We also gave our son crayons and let him help mark the boxes as we packed them. We showed him how we were writing on them to guide the movers and he helped by adding his artwork to the outside of some of our packed boxes. Letting him be apart of the process gave us the opportunity to talk to him about what was going on, explain the process to him and praise him for being a big boy who helps our family. When it comes to packing a house, nothing is worse than sorting through toys and play spaces - and one can pretty much guarantee that when a toddler lays eyes on an infant toy he hasn't played with in 2 years that you're about to toss in the trash, he will fall in love with it. My best suggestion is to do one massive clean out (when toddler is not home) of toys that have been outgrown or neglected for some time. Make sure to leave the current faves in their bins, shelves or baskets (same for books!) and then ask toddler for help in packing them up. Let him label boxes and tape them up - if he finds one he falls in love with all over again, he can leave it our for his special suitcase (see #5). We made sure to pack our son's room last - this serves two purposes, it allows them to stay comfortable in their space (especially for sleeping!) as long as possible and it allows their boxes to be loaded onto the truck last and then off the truck first at your new house. Setting up their space right away gives them a sense of home and gives them a haven during the chaos of a move. Items that need additional attention - like photos or bookshelves that have left holes in the walls that need to be patched - can always be packed ahead of time but leaving his bed in tact with all of his blankets, toys and lovies made a huge impact on keeping his sense of security during a time of major change. When in doubt, read about it! There are a ton of book geared to toddlers and preschoolers about moving to a new home and I think we've read every single one. I love this Berenstain Bears book (that was gifted to us by our mortgage broker!) and this is a great read for older kids (ages 5-11) and, of course, you can't go wrong when a puppy is involved! We left out our son's special suitcase (a very understated number with Mickey on it) for the day of the actual move and he packed up his most treasured possessions himself. We then loaded the suitcase into our car with him so that he knew his most loved things wouldn't get lost or misplaced. He rolled that little suitcase with pride and was ready to unload it and get settled as soon as we made it to our new home. 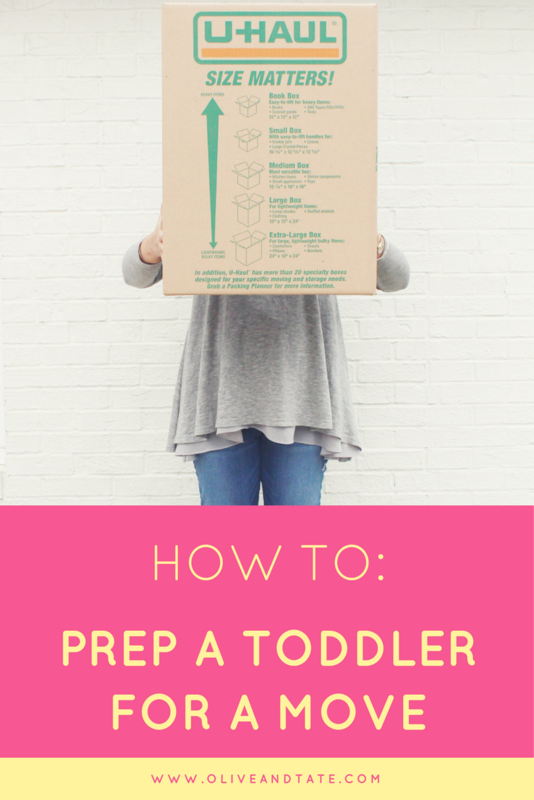 If you've moved with a toddler, tell me what worked for you! We had a fairly long overlap where we owned both houses, and we took our daughter (24 months) to the new house frequently to visit her room and play in the new yard (and see the renovation). The new place was a fixer, but we made sure her room was completed (new paint and carpet) before the move. The day of the move, we completely unpacked her room so it was ready to go. We didn't have any trouble at all, and she never asked about the old house after the move! We had staged the old house to sell, so all but her favorite toys had been packed up for over a month before the move.